HandKrafted by Stephanie: Taylored Expressions September Key Ingredients Blog Hop!! 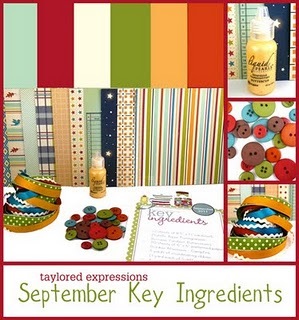 Taylored Expressions September Key Ingredients Blog Hop!! If you are looking for my Sparkle Creations challenge post, please scroll down or click HERE. Thanks! Hello! Welcome to the September Taylored Expressions Key Ingredients Blog Hop! Today, we are showcasing the September Key Ingredients! Each month, the team shows you 6 days of projects on the Key Ingredients blog to get your creative juices flowing. In case you missed any of this, please be sure to check out the Key Ingredients blog HERE. This month's kit features patterned paper from the October Afternoon Campfire collection, coordinating cardstock, ribbon, buttons and Buttercup Liquid Pearls. I have two projects to show you today. The first is a 11" x 8.5" scrapbook layout. As much as I love to make cards, my true love of paper crafting roots lies within scrapbooking and preserving family memories. 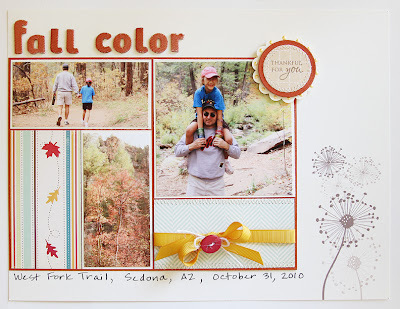 The colors in the kit were perfect for a scrapbook page to show some photos from a day trip that we took to Sedona last year. I used Celebrate Life, which is full of whimsical images and sweet sentiments that I compliment the rich fall colors in the patterned paper and cardstock included in the kit. The letter stickers are left over from the May Key Ingredients. They were originally white, so I sprayed them with Glimmer Mist to match my colors. Here's a detail shot of my sentiment panel. I added some stitching and Liquid Pearls around the scalloped circle, then popped it on my layout. My next project is a card using the same stamp set and more of the patterned paper included in the kit. If you're not yet a Key Ingredients subscriber, I hope you'll consider joining us! Take a peek around to find all the information you need to know about our kit club! Click here to learn more about subscribing or click here for our FAQ page! You can also visit the Taylored Expressions Key Ingredients Gallery (click HERE) for more projects created with this month's and previous month's kits! Accessories: Standard Circle Nestabilities (Spellbinders), 1 3/8" circle punch, Scalloped circle punch (EK Success), Ribbon, Button, Buttercup Liquid Pearls (September Key Ingredients); Letter stickers (May Key Ingredients), Harvest Orange Glimmer Mist (Tattered Angels), Twine (May Arts), Foam tape, Thread, Sewing machine. Accessories: Medium Scalloped Border Die (Taylored Expressions), Standard Circle Nestabilities (Spellbinders), 1 3/8" circle punch, Scalloped circle punch (EK Success), Ribbon, Button, Buttercup Liquid Pearls (September Key Ingredients); Clear embossing powder, Harvest Orange Glimmer Mist (Tattered Angels), Twine (May Arts), Foam tape, Thread, Sewing machine. Fabulous projects! Love the layout!! 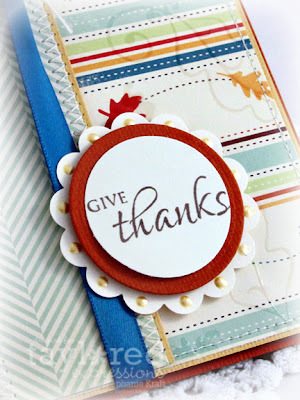 Cute card and I love your scrap page! This card is so pretty! And your layout is fabulous! Love both of your projects - great use of the paper! Great touch with the leaves! Have a great day! Your layout is great!! Love the details and how you stamped off to the side. Nice card as well, love the stitiching and your design!